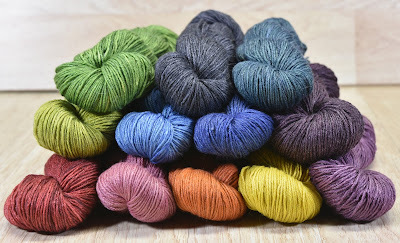 This has been hard to keep under wraps for these past few months, but at long last we can reveal our brand-new palette of standard "house colors" for our popular Lhasa Wilderness and Himalayan Trail bases! Hand-dyed for us by a local Colorado Dyer, MJ Yarns, these semisolid colors are dyed especially to create colors with depth and character. The dye techniques employed may take a little longer, but that effort is well worth it for our customers who will find they don't need to work from two different skeins to avoid color pooling! 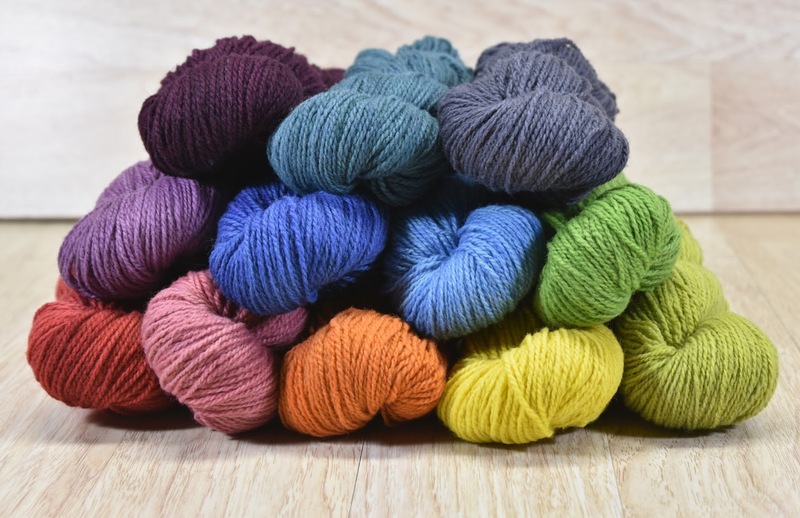 In addition to these standard colors, MJ Yarns will also be producing a set of Limited Edition colors on various blends for us, too. We'll keep you posted here on the blog, but we also recommend following us on your social media channel of choice (Facebook, Ravelry, Instagram, Twitter or Pinterest) and subscribing to our newsletter for up-to-the-minute breaking news. Top, L-R: Burgundy, Deep Teal, Charcoal. Middle, L-R: Lavender, Blueberry, Azure, Olive. Bottom, L-R: Scarlet, Soft Pink, Carrot, Sunshine, Pistachio. Top, L-R: Olive, Charcoal, Deep Teal. Middle, L-R: Pistachio, Azure, Blueberry, Burgundy. Bottom, L-R: Scarlet, Soft Pink, Carrot, Sunshine, Lavender. Not sure how to care for yak yarn? 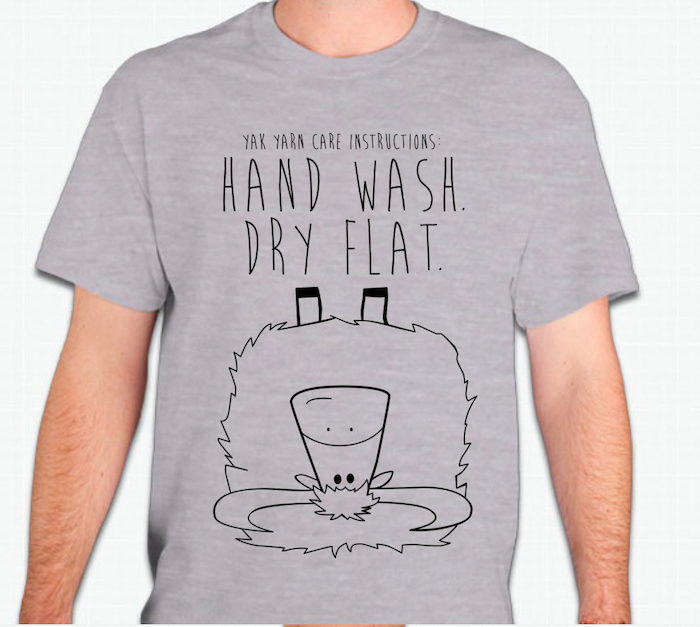 Don't worry, we've got you covered - just hand wash with Allure Fiber Wash and dry flat. 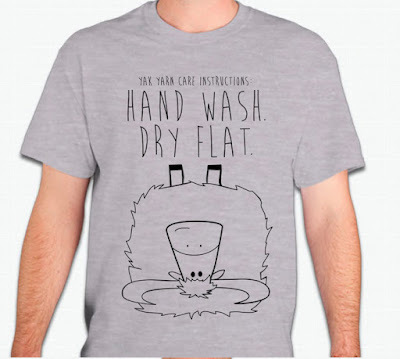 If you need a visual, check out our new Yak Care T-Shirt; it really doesn't get any easier than this! All of the above is available now in our online store, and we'll also have our new yarn colors & t-shirts at the Estes Park Wool Market this weekend. 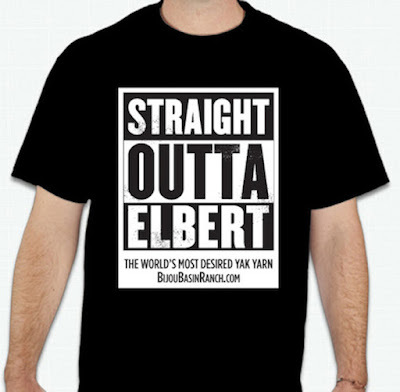 If you planning to attend, be sure to drop by to say hello and see what's new!